Stampin Up Demonstrator - Lynne Fahey (Spiralz and Curlz): New Stampin’ Up! annual catalogue is here…..
New Stampin’ Up! annual catalogue is here…..
At last, our new Annual Catalogue is available to you! It is packed full of wonderful new products. There are new stamps, ribbons, plenty of kits, punches, Project Life (a new simple way to scrapbook or memory keeping) Blendabilities (alcohol markers in Stampin' Up! colours) and fantastic papers ....... and so much more! I am having an Open House on Saturday 12th July 2014, held at my home in Buckingham from 11am until 2pm. The cost is £5 per person and is payable in advance to book your place and join the fun! There are a limited number of places for the make and take so booking early is essential. If you're anything like me, you are going to LOVE this catalogue, I think it's the best yet!! There is also a new stamp format - Photopolymer! These stamps are completely clear and you use them with your acrylic blocks. You will see them throughout the catalogue for some of our alphabet, border and large-text stamps. 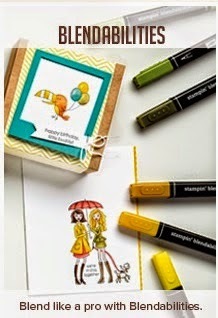 They make the placement of images so easy for two step stamping. Click the catalogue image above to download a pdf copy to your computer, tablet or phone. You can place an order with me via phone, email or via my Online Shop. And for any online orders over £30 I will send you a little gift along with a Thank You card. So enjoy having a browse through and I would love to hear from you.